In support of all the kids struggling with smiles on their faces! 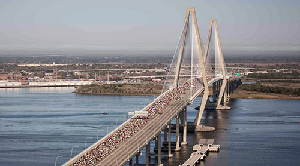 Designed as an endurance event, the Cooper River Bridge Run gives participants the opportunity to tackle 6.2 miles from Mount Pleasant to Downtown Charleston crossing the beautiful Arthur Ravenel Jr Bridge! This high quality, chip-timed race caters to all levels from novice to advanced runners. By joining the Running Wild for Wishes team, you'll be signing up to run the 10K as a team member supporting Make-A-Wish South Carolina. You'll be doing what you love and crave - running in a stunning setting - but on top of that, you'll be making your run worth so much more than personal achievement. You'll be helping make wishes come true for a seriously ill child. To begin your journey, please contact mrice@sc.wish.org for a registration form to join the Running Wild For Wishes team. We are fundraising so more courageous kids and their families can know the happiness, relief and renewal a wish can bring. Support a "Wild One" by clicking the donate button beside their name in the list below.